Managed to suss it out. 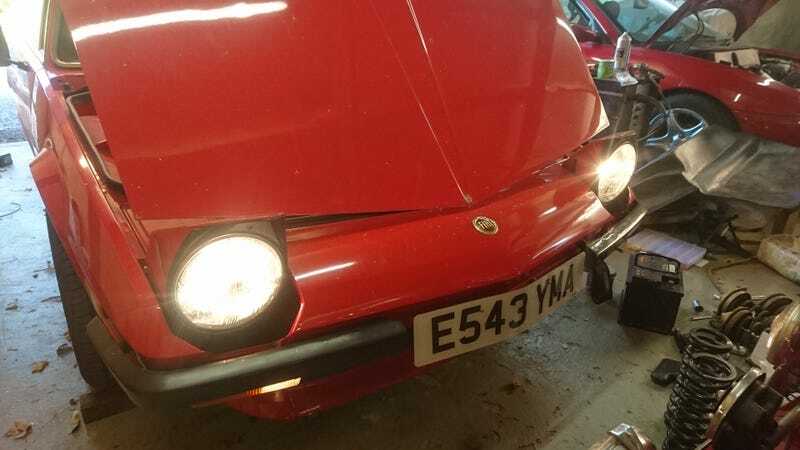 Apparently on later UK X1/9s Fiat added a fog light system using two relays that don’t appear on any other wiring diagrams. These relays fit inbetween the headlight popup switch and the column switch with wires that traipse all the way from one side of the car to the other and back again. The first relay is just used to trigger the second and power the foglight switch (through some dinky little wires which is why they were melted). The second relay powers the headlights through a resistor (again, on the opposite side of the car and back again) so you get dim bulbs for your foglights when the lights aren’t on. That did mean that we had two free relay sockets and a fuse holder within the factory fusebox to repurpose to allow a relayed feed for the dip beams and a relayed feed for the foglight (you only need the rear one and a warning light for the MoT). Now if only the clutch slave hadn’t just let go we’d be getting somewhere!